Old Skool Disco Party Night! Come along to The Falkirk Stadium and go back in time to those school discos! Dance along to all your favourites and re-live good times with friends new and old. 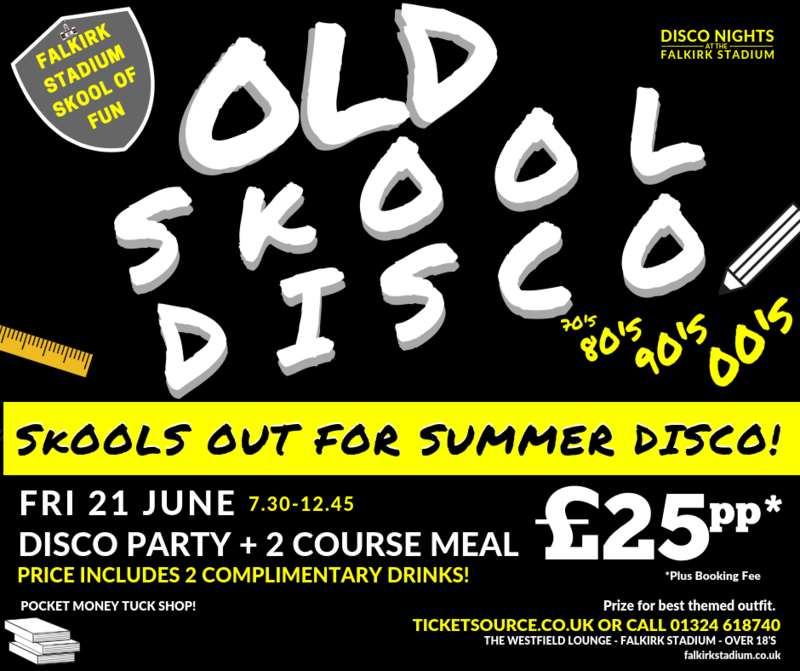 So grab your old school tie, get your hair into pigtails and get ready to boogie to some old skool classics. The school tuck shop will be open for some nostalgic sweet treats, so don't forget some pocket money. So come on and let your hair down and party, as there is no school in the morning! Enjoy a 2 course meal, and entertainment 'til late. Plus 2 complimentary drinks. £25pp + booking fee. Booking fee applies to online bookings only. Door open at 6.45pm and the meal will be served at 7.30pm. *Free Drink Options are a glass of house wine, bottle of beer and any soft drink. Should you or anyone in your party have any dietary requirements, please get in touch with our Catering Manager in advance on 01324 618740.